Wow, I haven’t done one of these for a while! Worldly Encounters: The friendly, English-speaking extraterrestrial you run into outside your house is asking you to recommend the one book, movie, or song that explains what humans are all about. What do you pick? So this extraterrestrial’s friendly is it? Wants to learn ALL ABOUT US does it? Hmm, I’m suspicious. Even if he/she/it is telling the truth, what about its friends? 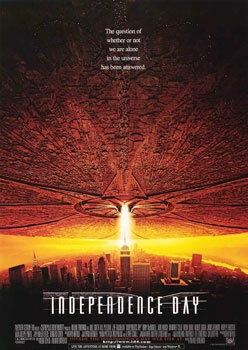 For this reason I pick the film “Independence Day”. This would serve as a warning to keep them civil, just in case they get any funny ideas about making our planet (or what’s left of it) “their own”. They’ll soon see that if they step out of line, we’ll stuff a USB key in their mother ship’s dashboard and infect their little green asses with viruses and trojans and maybe a bunch of spam selling “enlargening equipment”. And their shields will fail as well. Image Wikipedia, believed to be copyright 20th Century Fox, low resolution version unsuitable for reproduction etc etc. A main plan and a backup…well thought! That’ll teach ’em! Just make sure you get written permission from 20th Century Fox before showing the film to them…. I’m sure the spam will do the job, with or without the viruses, trojans, ad nauseum. Or we can just punch’em in the whatever you call that thing that’s sort of a head. In the film Will Smith did have some success punching an alien in the head-like thing, I seem to recall. If that fails, there’s always reality TV to upload into their computers. That will make them run away. I didn’t think of that. It would certainly make me want to go return to the stars.